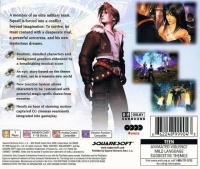 Box Text: A member of an elite military team, Squall is forced into a conflict beyond imagination. To survive, he must contend with a desperate rival, a powerful sorceress, and his own mysterious dreams. Realistic, detailed characters and background graphics enhanced by a breathtaking musical score. An epic story based on the theme of love, set in a massive new world. New Junction System allows characters to be customized with powerful magic spells drawn from enemies. Nearly an hour of stunning motion-captured CG cinemas seamlessly integrated into gameplay. 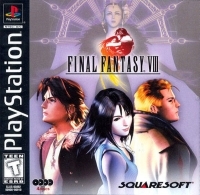 01-23-2016 pacpix Box Text A member of an elite military team, Squall is forced into a conflict beyond imagination. To survive, he must contend with a desperate rival, a powerful sorceress, and his own mysterious dreams. Realistic, detailed characters and background graphics enhanced by a breathtaking musical score. An epic story based on the theme of love, set in a massive new world. New Junction System allows characters to be customized with powerful magic spells drawn from enemies. Nearly an hour of stunning motion-captured CG cinemas seamlessly integrated into gameplay. This is a list of VGCollect users who have Final Fantasy VIII in their Collection.